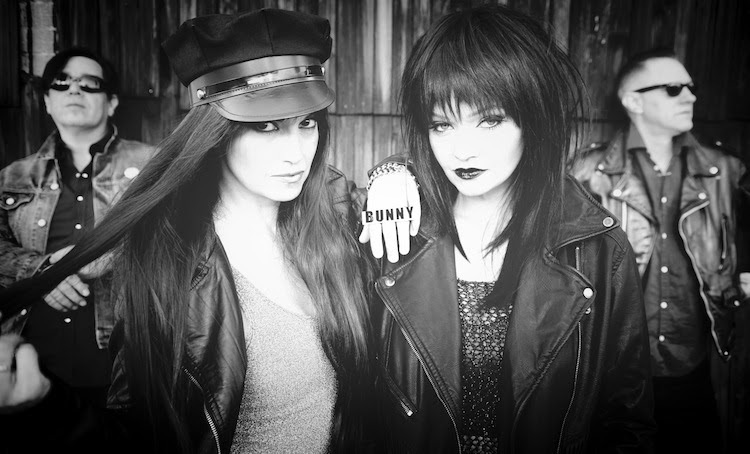 "Motobunny is a brand new, Icona-Pop-Meets-Iggy-Pop, American rock n’ roll band with two dynamic frontwomen and a debut album poised for a May 12th release on Rusty Knuckles Music. With tracks already spinning around the country on stations like Sirius/XM, KROQ (LA), KEXP (Seattle), WFMU (NJ) and WRUR (New York), momentum is building and plans are being laid for release parties in their hometowns of Phoenix and Los Angeles. Led by dual singers Christa Collins and Nicole Laurrene, the band’s aesthetic has as much to do with Laurrene’s Michigan rock roots as the surf sounds and pounding percussion of LA’s punk and garage scenes. Rarely does a rock band present with two such well-matched, intense vocalists, but the rest of Motobunny keep up easily, ripping through songs straight out of a Tarantino film. Motobunny formed after members of two acclaimed rock bands, The Love Me Nots and The Woolly Bandits got on stage together in 2013. After years of sharing green rooms, tour vans, and seedy motel rooms, it was the first time they had performed as one band and the electricity was undeniable. Together they dashed off songs for a dual-frontwomen rock collaboration, enlisted the help of Love Me Nots drummer Jay Lien, and headed to Detroit to record a full-length album with Jim Diamond (White Stripes, Electric Six, Dirtbombs). Mixed by Bob Hoag (The Format, Deer in The Headlights, Ataris), and mastered by Jason Livermore (Rise Against), the result is 12 tracks of tough rock n’ roll topped off with a girls-just-wanna-have-fun attitude. The band’s anthem “Motobunny”, released by Rusty Knuckles Music as a teaser single and music video, was featured in Blackheart films’ 2015 release Jack and Cocaine, produced by Blackheart Records’ Cyn Posner. The band performed its debut concerts in Phoenix and Los Angeles in Spring 2015, along with performing a live-streamed worldwide concert from Six01 Studios. Following the online show, the band was taken on by Starry Management. Over the years the musicians of Motobunny have placed music in television shows like Rescue Me, Fairly Legal, Bad Judge and Being Human. Christa Collins has performed and recorded with Michael Jackson, Little Richard, and Sky Saxon, just to name a few. She currently fronts LA garage act The Woolly Bandits, became an X Factor USA top 8 finalist and has appeared in several films. Nicole Laurenne was an award-winning classical pianist as a teen, has been named Arizona Republic’s Best Frontperson and currently fronts both the The Love Me Nots and electrofuzz duo Zero Zero. Guitarist Michael Johnny Walker is on Phoenix New Times’ list of the Top 10 Phoenix Guitarists, founded and currently performs with The Love Me Nots, is featured in Fender Guitar’s “Soul of Tone” film with Dweezil Zappa, and both produces and performs with Zero Zero. Bassist Rik Collins has toured and recorded extensively with legendary garage rock act The Seeds before founding and performing with The Woolly Bandits."